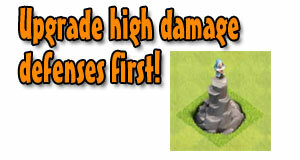 It is wise to upgrade your defenses that do the most damage first. Mortars and wizard towers that do splash damage should be high on your list to upgrade as they attack whole groups of attackers. Also look at the damage per second (DPS) for single target defenses to choose which one to upgrade. Hidden tesla’s are also a good deal because of their high dps.